We’ve hit a bump in the road at school for Elliott. Not huge, monumental stuff – but not so much fun either. It happens 2-3 times per year for him, and always surprises me no matter how often it sneaks up on us. All of a sudden, one day he wakes up, and for lack of a better description, looks like he’s had one to many cocktails. His eyes are glossy, he laughs inappropriately and for no reason, his speech is slurred and his attention is nearly non-existent. He’s also more prone to temper outbursts, which is a huge bummer because he’s come so far in this department otherwise. After much contemplation, Elliott’s enormously talented health-care provider and I think it has something to do with allergies/mold, etc. It’s frustrating because we’ve had him tested multiple times and in various ways for allergies, and the test results are always negative. But, especially in March, just like clockwork, I call Gretchen’s office begging for her to see Elliott right away as he’s broken out in red welts, not sleeping, congested, and has a huge spike with a variety of self-stimulatory behaviors and tantrums. This year when I called, her response was, “you realize this is exactly one year and a day from when you called last March”. It’s weird, and I wish I understood it more, but I don’t. Neither Tom nor I have allergies, and we have to rely on others to share with us what it feels like, so that we can have a sense of what he might be going through. Generally, we have to increase medications and sleep aids for about two months, and then for whatever reason, things settle down into a comfortable rhythm again. This time, it was more subtle as there were no red welts, or obvious signs of allergy. There had been no medication changes, no dietary or routine changes, no real reason at all that I could attribute to such a marked change. He just one day woke up and seemed like a completely different kid – ugh! I sense he doesn’t enjoy these phases any more than we do – when this happens to him, he’s not a real picnic to be with and very likely does not feel like himself. The quote of the day from his 5-year-old sister has been “Mom, Elliott’s bugging me again” or my personal favorite “Mom, Elliott’s being a jerk” (This one may have come from a young man whose name starts with H). All of this fun led to some conversations with teachers – mostly to determine if they were noticing the same things at school that we were at home, and indeed – they were sharing in the fun as well. And so, although we made it almost 4 months without ADHD medication, and he’s grown like crazy all summer, it was time to gently introduce medication again with the goal of increasing his ability to focus and learn while in school. While hopefully this is just one of those funky phases that have become part of Elliott’s life, we still need to help him through it, and to give him every tool we can to allow him to learn – even when it’s extra challenging. Poor guy – it tears me apart that we can’t determine why this happens or even what exactly it is, but, thanks to a great partnership with his teachers, things are already gradually improving. That said, on top of for whatever reason being a bit dazed and confused (is he going to be ready for his freshman year of college or what? ), he had to learn a tough life lesson last week, though I only learned of it yesterday conversing with his special education teacher. As a new student in his school this year, Elliott has been getting to know other kids in his class. He started the year knowing one classmate quite well from their pre-Kindergarten days, and has had great fun reconnecting with him, but was not really familiar with anyone else. Unfortunately for Elliott, who just genuinely likes all people, he had to learn that just because you want to play with someone does not mean they want to play with you. Yes indeed, Elliott has now experienced the scorn of a woman, and is quite devastated about it. As I understand it, Elliott has shown an interest in this young lady since school began. She is not thrilled about having anyone too close to her (uh-oh, can you see where this is going), and has been less than subtle about not wanting E to follow her. When asked about why he is following her on the playground, he tells us “I want to play with her, and good friends hang out close to people they want to play with” Yeah, well, I kind of know where he’s coming from, and yes, we may have suggested in years past that if you go to the park with a friend, it’s a good idea to hang out together rather than run off and only do your own thing. Again, this gray area stuff is not the E man’s area of strength. Eventually, his “following” of this young lady led to having to sit on a bench during recess, and when he returned to the classroom, his teacher told me he was distraught. He was sobbing and sad, and had to spend some time in the quiet corner in order to get himself together. His very kind and talented teacher then chatted with him, and tried to explain that even when you do all the things you’ve been taught about how to make and be a good friend, not everyone will want to be your friend. Ouch. My eyes well up even thinking about how hard that is to learn for any kid – let alone when you throw a little autism into the mix. Life does send us down some unexpected and sometimes painful paths – I am grateful he has such a wonderful support system outside of our home to help him navigate these unchartered waters. Thankfully, that was not the only news she shared with me that day. There is a glimmer of hope so exciting that it negates all the scorn of the previously mentioned young lady. Elliott has been hanging out with a classmate from his mainstream 4th grade class, and by all accounts, they are starting to forge a friendship! This is someone he’s gotten to know all on his own without anyone suggesting it or giving him assistance. Wow – that’s the kind of news that makes me realize he is slowly and gently starting to want to work on things like forging new friendships because he feels that need himself. Yes, it’s a baby step – but we’ll take it and celebrate with him. Last week was not the best week for anyone in our house. Nothing earth shattering – just minor bumps in the road. Everyone got flu vaccinations – and everyone got head colds from them (this happens every year; you’d think we’d be used to it). However, this year, Ada’s head cold turned into strep and an increase in her hyper-activity behaviors that was less than fun to put it mildly. Just ask anyone at Target. Elliott had his expander placed at the orthodontist office, and I’m pretty sure based on our appointment alone that they may soon install private rooms for patients. Yeah, Ada climbing and jumping repeatedly off of moving dental chairs (while screaming), and slamming their glass doors. Elliott in tears (while drooling) because it felt weird, and he realized he could no longer eat popcorn or twizzlers. And me, trying to deal with 2 children in really challenging situations while they try to show me how this crazy expander things works (I still can’t find this tiny hole they are talking about – whatever). Thank goodness for Prozac – as it’s inappropriate to consider margaritas at 10:30 a.m. though I can’t say it didn’t cross my mind. And then there’s Henry. He’s who I’m worried about the most these days. For as much as we talked about 3rd grade being an adjustment, it’s all starting, and our once sweet, easy-going, creative guy is struggling, and it’s so hard to watch. I just think he’s trying so hard to find his place in the world, and that’s just never an easy thing to do. Hardest of all is respecting the fact that he’s a private person, and generally has to ponder things on his own before ever sharing with us. Most days, it’s a miracle if I can even learn about what he had for lunch. What happened to that cute 5-year-old boy who came home one day from school and said “how in the world am I supposed to find a wife if girls in Kindergarten won’t kiss?” Oh how I miss him . . .
What’s weird is that in so many ways Tom & I have this parenting of kids with autism thing down – expect the unexpected, make things visual, plan, anticipate, only put kids in situations where they (or we) can be successful, (not the orthodontist in case you were wondering), etc. But when it comes to Henry, our so called typical guy, I feel lost. Are these things that all kids go through, or is it just Henry? How do we deal with this without driving his wonderful new teachers crazy? Is this serious, or just a blip on the screen of life? Yep, it was just not a great week. Finally it was Friday, and a lovely morning when we all walked Henry down to his bus stop. We were all ready for this week to be done (well, especially me), and then it happened. Elliott approached the crowd and spoke loud and clear “hey everyone, just so you know, I have a lot of money”. That brought more than a chuckle or two as you might imagine, and though I don’t think it registered for him, I could see his bright smile fade. Yes, even though I think I’ve developed thicker skin through my years as an autism parent, at that moment, after the week we’d had, I just wanted to cry. Henry was just plain embarrassed. Yes, I did quietly take him aside to explain how he might more appropriately share with everyone that he has been saving his allowance for many months, and finally got above $50.00, an event that he is beyond proud of. His intentions were good, his approach, well, it needs work. That is autism and how it affects Elliott, and in many ways, probably always will. I hate that. I accept it, but I hate how hard it is for him. Ugh – what a week. I was emotionally in my bad place when we started preparing for our run on Friday night. You see, running is something we have all learned to do to help deal with stress, and man did we all need a little stress reduction right about then. About 6-months ago, we all sat down (somewhere near the red couch) to chat about which race to register for during the Twin Cities Marathon Family Events Day. Both boys had completed 5Ks and last year, Ada ran the 1 mile race, which is not too shabby when you’re 4! Were we ready for something more? The boys were a bit unsure of this whole 10K thing – it seemed like a lot. But for Elliott, who is a strong, natural runner that needs to run to deal with his anxiety and Henry, who is not as much a natural athlete but who needs something athletic to build self-esteem and enjoys the time with his family, it seemed doable. We trained all summer – short runs, long runs, runs on the track, runs throughout the sidewalks of Eagan, even running on vacation! These guys were dedicated, even if a bit grumbly about it here and there. 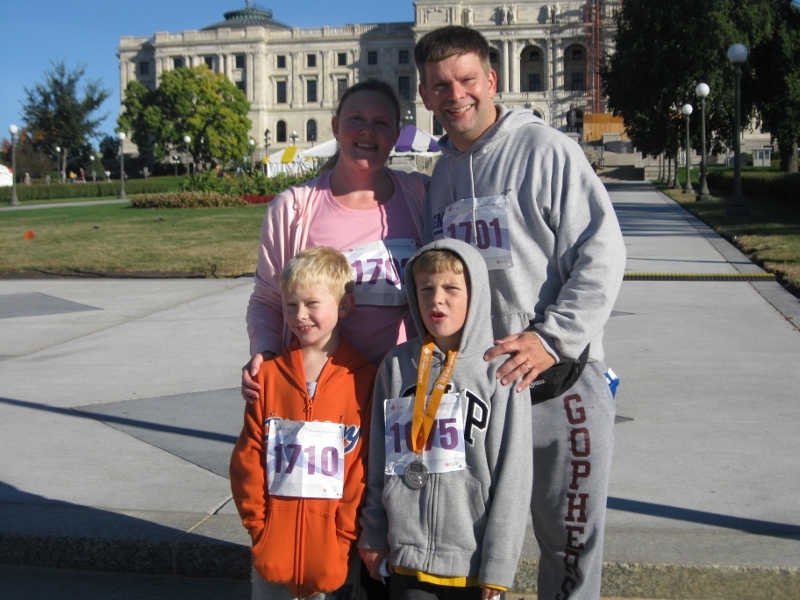 Saturday morning, all 4 of us pinned on our race numbers and headed down to the State Capitol in the cold morning air, ready to join 3,000 others in a 6.2 mile run. (Ada chose to stay back home with Grandma, and shared some Cinnamon Melts from McDonald’s rather than run – arguably the wise choice). Elliott got quite anxious once we got near the crowds – running for us is almost always done either alone or with just a few other people around. He was very worried about where to meet following the run and was rubbing his head and biting his nails which is how he handles stress. We ran through our plan 3 or 4 times just to make him comfortable. Henry got quiet, but worked hard on his stretching. Sensing he needed a pep talk, I told him, as we’ve discussed so many times, that he could walk as much as he needed, and to just keep putting one foot in front of the other. Speed did not matter, just doing it his own way, in his own time was what we hoped for him. Then, just before the starting gun sounded, they were both in the zone. Elliott, now confident he understood the plan, disappeared into the crowd, wanting to be independent and feeling a bit competitive. Henry stood between Tom & me, and was smiling as he heard his chip beep when we ran over the start line. The boys did an amazing job that morning. They each tackled things that were not easy for them – Elliott navigating a big crowd with great focus and Henry tackling a distance he didn’t know he could. As each of us crossed that finish line Saturday morning, the week that had been so challenging just melted away. The boys were so proud of their accomplishments, and attained a goal they set for themselves and worked hard to achieve. Best of all, they congratulated each other for their efforts, and talked about their individual journeys along the way over a well-earned pancake platter. As it is with most things in life, this run was more about the journey than the destination. So much has changed in our lives since we started training 6 months ago. Yes, we’ll continue to have our share of weeks that are not easy, but as long as we keep putting one foot in front of the other, we’ll get there in our own time, we’ll be there for each other, and we’ll do it together . . .